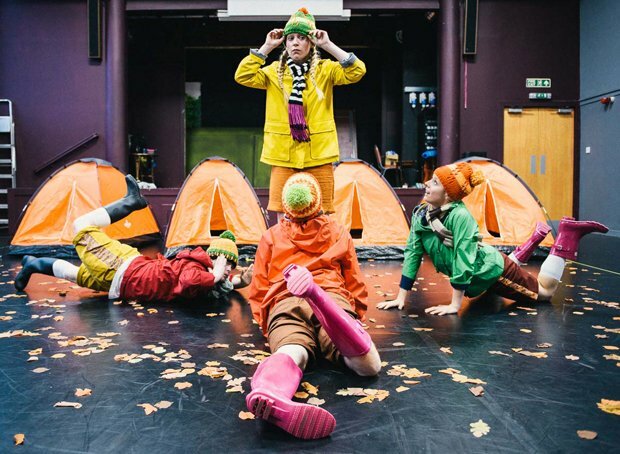 Oodles of fun and lashings of easily recognisable ideas ensure that Indepen-dance 4's Four Go Wild in Wellies is an instant hit with its target audience of pre-schoolers. Four tents at the back of a stage littered with fallen leaves, and a soundtrack of forest birds make for an autumnal setting as the audience take their seat. When the lights go down, and the tents start dancing to a simple melody, you know it's going to get a little silly – and the giggles keep on coming. The four dancers do eventually emerge, and spend plenty of time playing around with getting dressed before – at last – getting to the wellies and setting forth with some galumphing dance moves. There's a strong narrative in here too, however. One that cuts through the giggles when a game of statues gets out of hand and two of the dancers, Emma Smith and Julie Spence, take the huff with each other. Fortunately Adam Sloan and Blair Flucker are on hand to play their own games and entice them back into the fun. Ultimately this is about the joy of exploring the world, celebrating life and getting on with those around you. Dance Base, until 26 Aug (not 13, 20), 2.10pm, £9 (£7).